The destructive effect of Beavers in Patagonia. These Northern Hemisphere animals (Castor canadiensis) were introduced to Tierra del Fuego Island by the Argentine navy, to kick-start the local fur industry. It was a failure so some tender hearted navy man, instead of killing off the twenty five pairs of beavers, set them loose in the wilderness. They expanded quickly and adapted marvelously to the new environment. Nowadays they number between 35 and 50 thousand,  and their territory occupies a large portion of Tierra del Fuego Island and several smaller ones in both Chile and Argentina. To make matters worse, beavers have left Tierra del Fuego and colonized the southern tip of the continent at Brunswick Peninsula. The Chilean government is working hard to errdicate this foothold and to create a buffer zone on the Island. If beavers manage to gain a firm hold on the mainland, the whole ecosystem of the Andean Forests will be at risk. The local forests made up mostly of Nothofagus (Southern Beech) have not co-evolved with beavers like the Northern Hemisphere's forests. They grow slowly and just can't keep up with the logging habits of beavers. Furthermore, the guanaco feeds on the new saplings and the combination of flooded forests (beaver dams block the flow of rivers and flood the woods), tree foraging and slow growth / sapling destruction is taking its toll on the Fuegian forests. 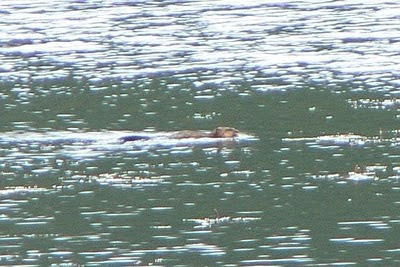 For someone on a tourist excursion along the lake, a beaver head appearing on the surface would be a frightening experience. One that could easily be attributed to a lake cryptid. Photograph is copyright © by Alec Earnshaw, Fauna of Argentina, it has some beautiful photographs of the Fuegian Fauna. I found your excellence articles on your blog about patagonian cryptids. This is fantastic. Curiously is situation of beaver in Tierra del Fuego. As invasive species not always can be positive influence for local environment. I very interested in for a few years in one cryptid - andean wolves. Do you have any informations, where andean wolf tracks can be found?They can still alive or extinct? On the track of unknown animals. On the track of the andean wolf. I want will go to Andes for a future for search unidentifed canids, include andean wolf. Do you give me some guidance for that? What I must take and where look for and carry out the survey?